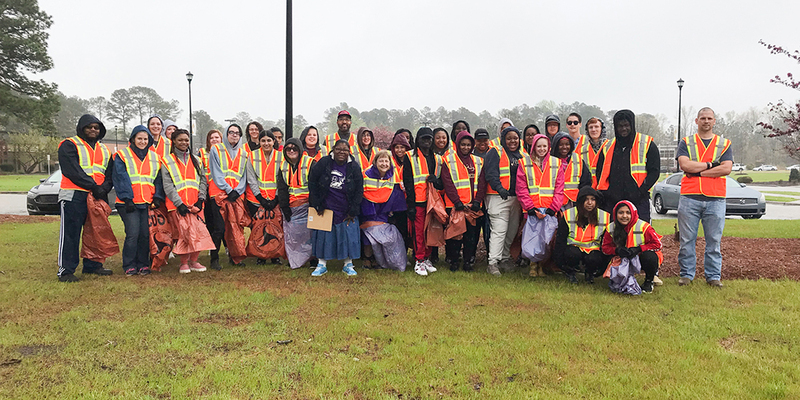 Despite soggy weather on Saturday morning, thirty-eight Edgecombe Community College students and staff donned rain gear to work in the spring Adopt-A-Highway cleanup sponsored by the College’s chapter of the Phi Theta Kappa honor society. ECC President Dr. Greg McLeod (middle back) was among the volunteers. Thirty-six bags of trash and recyclables were collected by the group during the drive. The Alpha Omega Nu chapter at ECC has been responsible for a three-mile stretch of road in front of the Tarboro campus since 2000.